We started selling Revere Ware replacement parts in 2008. In the 7 years since then the web has changed quite a bit. Recently, we felt that our website started looking outdated and became increasingly hard to manage as compared to today’s more modern platforms. Additionally, the USPS recently changed their interfaces and it broke our international shipping. Earlier this year we embarked on a redesign and upgrade. I am happy to say that we are now live with the new site, and shipping to Canada is working again. Other countries will follow in the coming months. 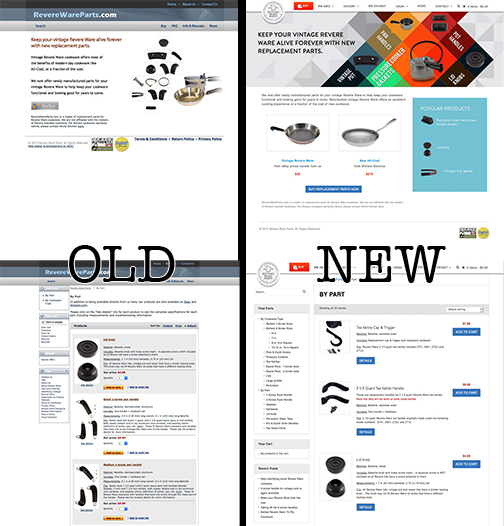 If you compare our old and new sites, you’ll see quite a few changes in aesthetics as well as more convenient organization of information. For example, we now include all relevant content related to a part right in the product details for that part, as well as links to other related parts; if you are looking for the correct size of 2-screw handle, you can easily navigate to any other size of that handle right from the product page. We’ve done our best to migrate all user account and order information. If you have any issues using our new site, please contact us and let us know.